This distance learning course provides students and operational meteorologists with a better understanding of the meteorological processes in the tropics. It also aims to stimulate future research focused on forecasting problems in the tropics. 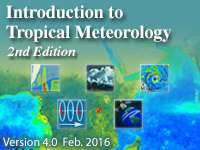 The course uses COMET's Introduction to Tropical Meteorology, 2nd Edition online textbook which provides an introduction to the atmospheric processes in the tropics and recent developments in the field of tropical meteorology. Optional, special topics lessons are included and will be added to as new lessons are published. Tropical weather features such as tropical cyclones, monsoons, easterly waves etc. The target audience includes undergraduate students and meteorologists who have completed introductory meteorology and who know basic thermodynamic and dynamic meteorology. For students wishing to explore theoretical derivations, familiarity with differential calculus is recommended.